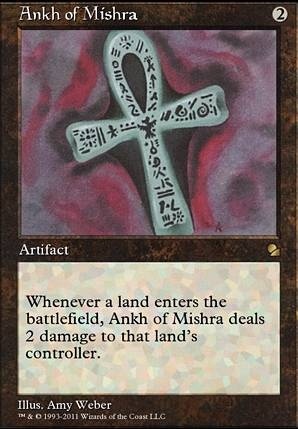 Whenever a land enters the battlefield, Ankh of Mishra deals 2 damage to that land's controller. The core seems solid, but I do see some pretty obvious upgrades. Lightning Strike (the card's power level simply isn't legacy playable) should be replaced with Lava Spike . It's a near-strict upgrade, as in a burn deck all you want to do is throw damage at the opponent's face anyways. Icy Manipulator , at four mana, is wayyyyy too slow. Take it out. Do the same with Fireball , which is similar. the rate is too slow. You need 4 mana to deal three damage. There are plenty of ways to deal three for 1 mana. Now we have 5 free slots. 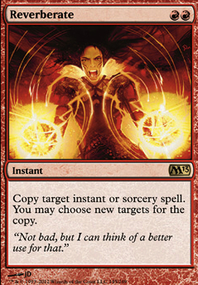 1: add another copy of chain lightning (another 1 mana deal 3 spell, what's not to like? ), 4x Rift Bolt (another 3 damage for 1) 4x Price of Progress (if usually deals at least 4-6 damage), another 2 Fireblast s (if you have one copy in hand, your opponent's life is virtually reduced by 4, since once they reach 4 life you can just kill them with it). Now, you can also go down the Winter Orb s and Black Vise s for 4 Skewer the Critics and 2 Light Up the Stage . This build is probably the strongest. 2: if you want a build that's more fun, like my list, you can remove the 4 skewers for another Vise and 3 Ankh of Mishra s. At that point, you could stop, but if you wanna go all in on the artifact plan like I did, you could remove Light Up the Stage for 2 Mishra's Bauble s. Now you're playing so many artifacts that you can support Shrapnel Blast which is extremely powerful. You can go up to three copies of it for some Rift Bolt s, Lava spikes, or chain lightnings - you decide. Mana Vault and Mana Crypt are even better than usual here! Staff of Nin xDD to deal damage to you! Ankh of Mishra would be amazing! Off of that staff one I though of Blasting Station ... there is some infinite combo there, right? Jinxed Idol might not be so jinxed after all! Ancient Tomb is amazing as well. That is all I have for that... now for some finishers once you have the life/token engine going! Well of Lost Dreams / Mentor of the Meek ? They would do a fair amount of work in terms of drawing. Felidar Sovereign / Archangel of Thune - normal lifegain shenanigans. Jazal Goldmane / Cathars' Crusade / Coat of Arms / Mirror Entity / Elesh Norn, Grand Cenobite - normal token shenanigans. Anointed Procession for more fun? Slate of Ancestry on that note. That's all I got... other than random anthem effects like Dictate of Heliod , but that would be too weak IMO. 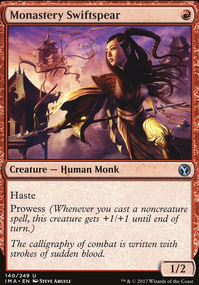 Hoobynobber7395, Alesha, Who Smiles at Death 's ability can only be activated during the attacker's step, allowing the opponent a chance to block Master of Cruelties during the declare blockers step (or to respond with removal). 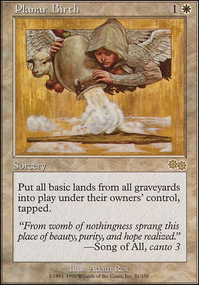 If you absolutely must connect with a player (and again, barring removal), a Dauthi Embrace would do the trick. 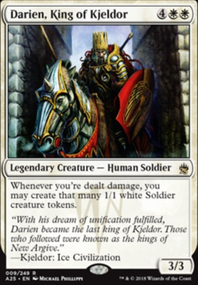 spoonlordprime, if you want to get your opponents to hate you, try turn one Sol Ring and Ankh of Mishra . 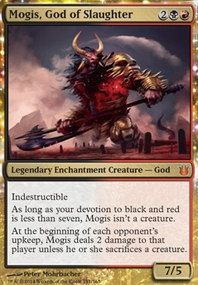 I've built a couple Mogis, God of Slaughter Group-Slug decks. I hope you would check one out tell me what you think. Maybe you'll also see a few cards that can liven up your deck, like Heartless Hidetsugu or Spellshock . What about introducing groupslug cards not related to drawing, such as Manabarbs or Ankh of Mishra ? Not sure how you feel about this, but you could always run land-hate like Zo-Zu the Punisher and Ankh of Mishra . If these get out early they can be a serious blow to players that ramp a lot. Authority of the Consuls could be decent since it does more tap control while gaining you life. Xantcha, Sleeper Agent fits so well into this theme, and has a lower CMC than a lot of the cards on this list, plus looks really fun to have go around the table. I hear she also makes a surprisingly good commander. I like her over the more expensive Crimson Honor Guard too. Furnace of Rath is functionally similar to Wound Reflection and cheaper to cast, just a thought. Ankh of Mishra is incredibly punishing as well, I saw you have Polluted Bonds on the maybe list. Ankh is a lot less CMC and functionally does the same thing. 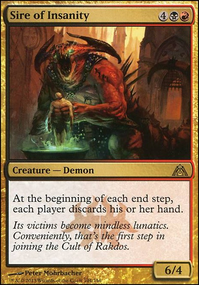 This deck seems rather cruel to your opponents but I guess that's the point of Rakdos ;) good luck! multimedia, thank you for the comment, all were useful suggestions. I agree the cmc was to high. Would Ankh of Mishra be useful in this deck? HI all, I want to make nasty land denial mono black deck, where opponent will be locked to play spells. any artifacts which generate mana? Gurmag Angler - use delve to cast him as soon as possible, and to clean graveyard from creatures for Nether Spirit. I was thinking about Tombstalker because he is flyer, but Angler is mana-cheaper. Anvil of Bogardan - maybe its bettter than Howling Mine because it makes opponents hand with no limit which support Black Vise damage. I know its messy right now and far from final deck but this is what I have right now. Problem is that I need mana to play key cards (Black Vise, Ankh, Desolation, Sinkhole) so I dont know how many lands to play. Please do you have any advice and improvements? Thank you very much for you time.